"For the sole true end of education is simply this: to teach men how to learn for themselves; and whatever instruction fails to do this is effort spent in vain." ~Dorothy Sayers There are two things that I think everyone needs to know in order to succeed in life no matter what they decide to do. They need to be able to research anything to understand it better & they need to know how to study properly to make the best use of their time. 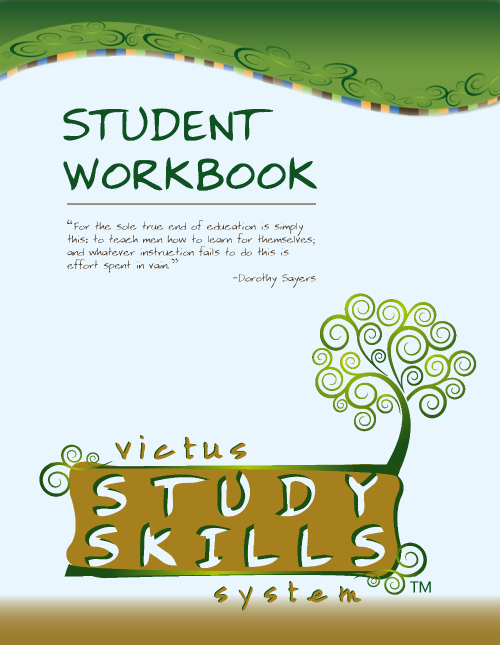 When we were offered Victus Study Skills System to review I knew I wanted Amber to use it before she starts high school. We received the Teacher Edition & Student Workbook. 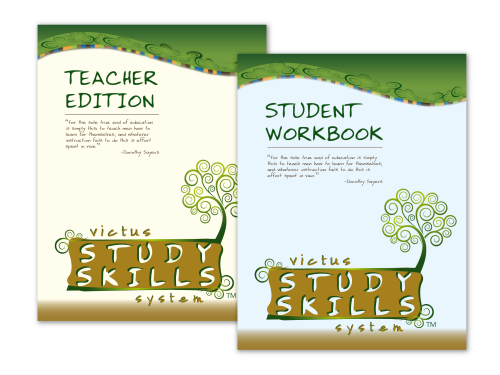 Victus Study Skills System teaches that study should become a way of life and their aim is to equip the student for success in academics and in life. It is geared mostly for 5-12 grade students, but it can be used with younger children with more parental involvement. The course is divided into 10 lessons and a high school student can finish it in one week & jr. high student could spread it out over two weeks. 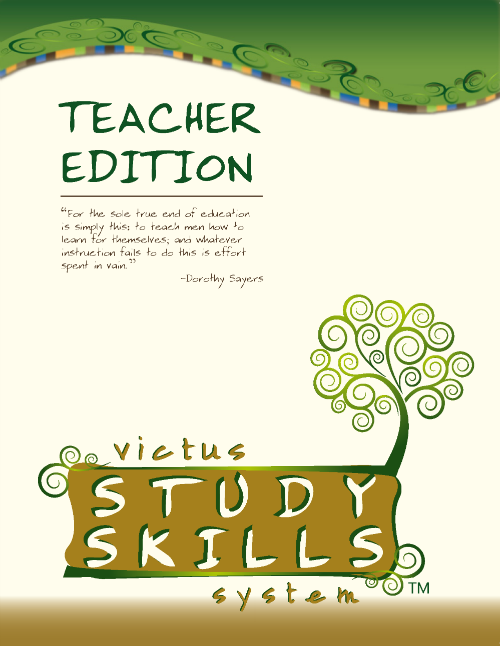 Susan Ison is the author of Victus Study Skills and she started on this journey when her first grade daughter asked her how to study for a test. Where am I now? ~ This foundation has the student looking at themselves. They look at their own study habits, and their learning strengths. Once they figure out if the are visual, auditory, or kinesthetic learners they can use the suggested learning aids for their dominate learning strength. Where do I want to be? ~ This foundation helps the student set their goals and priorities by looking at the future. It includes goal planning sheets where the student can write down their goals, and the objective and action plan for each one. How do I get there? ~ The third foundation looks at time management, schedules, and organization. It also gives study tips like where you should study, how to be an active listener, note taking, test preparation & test taking. All 10 lessons include a Purpose, Preparation, and a Procedure. The Appendix contains extra worksheets and tips that can be used throughout the course. The Teacher Edition has 82 pages, is softcover & spiral bound. It can be purchased for $40.00, & it is divided into three sections. Section 1 ~ Helps you understand the foundation of the course. Section 2 ~ This is the actual lessons, and each one includes the purpose, preparation, and at least one procedure. The student pages are included here exactly as they are in the Student Workbook except the Teacher Edition pages contains the answers. Section 3 ~ This is the Appendix section & it contains supplemental information that can be used in the course and follow up ideas for the student. The Student Workbook is a softbound spiral workbook and is available for $20.00. I had 13 year old Amber use this Study Skills System. She completed the workbook in two weeks by finishing one lesson per day. Some of the lessons we would read together and discuss a little before she completed the procedure section, and some lessons she just completed on her own. She thought the program was very easy to work through and spent less than 30 minutes on most of the lessons. We enjoyed going over Amber's learning strengths & the chart that determined she is a visual/auditory learner was right on. She has already been keeping her own monthly schedule for a couple of years so she was good on this section. She actually got the most out of the note taking hints. I think this is a very solid Study Skills System. Some of the things I thought were just common sense, but for a child that needs to develop study skills they are things that should not be overlooked.